Before or after reading this naked boat analysis, you may be interested in reading a short FREE book from Amazon called Flinch. It will transform you into an awesome person (simply follow the instructions); if that doesn't work, buy a sailboat! Naked Boat in the doldrums during my Atlantic Crossing. I sold the barbecue and the recently damaged windvane will be scrapped soon - the less clutter the better. This was pre-lazyjacks days, which explains the outrageous mainsail tie-down job...who's going to see you in the middle of an ocean anyway? After having been asked if my boat was for sale, as described in a previous post, and after being told that my boat was naked, I got to thinking about how naked is too naked! I mean, what do you really need in order to cruise safely and adventurously? Whether it be a one-month or a ten-year cruise. Sailing to a nearby marina doesn't count. 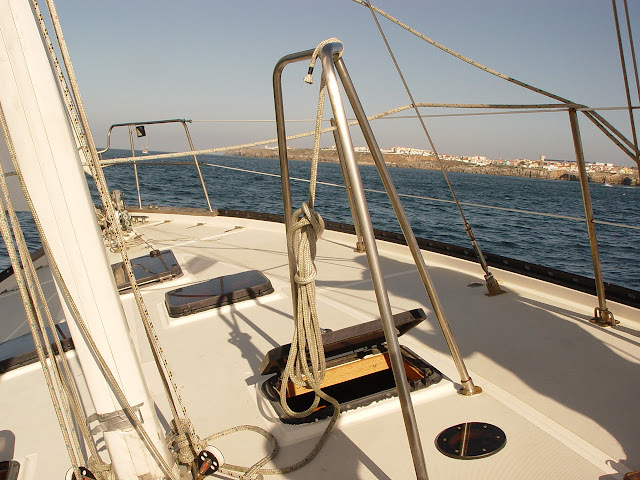 I'm talking about sailing and anchoring sprinkled with a few marina visits. I've sailed on a number of boats owned by other sailors - from a half rotten plywood boat to a new Beneteau 51. From my experience I've concluded that the best compromise lies somewhere between these two extremes since a big luxurious boat lacks the Slocum factor that has stoked many dreams and a really small boat will have you cursing and blaming Slocum for your miserably wet and cramped quarters. So, size matters: too big and luxurious numbs the adventure, too small and rustic dampens it. Then there's the equipment. Let me give you an analogy. Let's say that, being really fed up with living in the suburbs, you rent a charming grass hut on a tropical island for 6 months to escape from the fast-paced, gadget-filled, sedentary life that's poisoning your soul. You arrive in shorts, T-shirt, sandals, a bag full of books and a huge smile. Then you step into the hut and your jaw drops when you see a TV, leather couch, air conditioner, microwave, Wifi router, laptop, washing machine, bla, bla, bla. 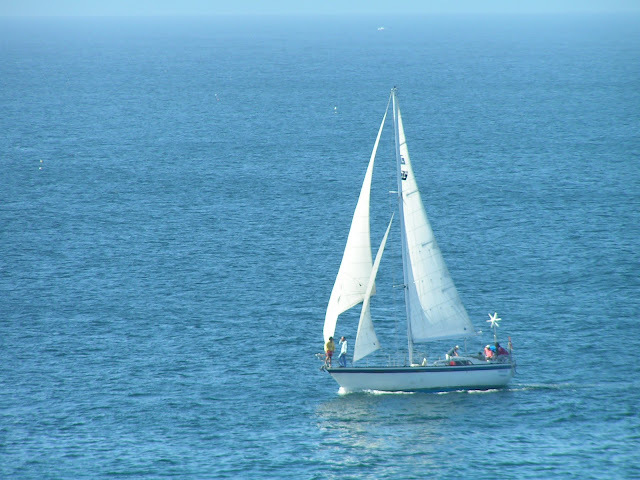 I believe that your gut reaction would constitute a fairly accurate barometer for determining what kind of sailboat and equipment is appropriate for your real personality, as opposed to your fantasized escape plan. And believe me, magazines have turned sailing into a fantasy; if you don't think so you haven't taken on many wannabe crew for a sail of over 6 hours. It doesn't take long for disillusion/boredom to distort most faces - the ones that didn't get seasick. Or maybe, just maybe, I'm a bad host. - Enough tools, bolts, screws, pieces of wood and other scattered stuff to drive most people nuts. - 350 liters of diesel in 2 stainless tanks embedded in expanding foam insulation and with inspection holes - spotlessly clean, no condensation, no algea. And a bunch of other miscellaneous stuff I'm not going to list because this is getting tiresome. I know sailors with really shiny mid-size boats with a bimini, dodger, fridge...you name it. But they're always running out of food, water and fuel or getting their fuel fouled with algae because the plastic tank is in the lazarette perspiring like mad. They have one undersized anchor (where would they keep the spare?) and a plague of underwater through-hulls. Tools and spares..."whatayoumean tools, spares, extra lines, a bosoms' chair...Are you nuts, I'm already overflowing with cereal boxes and beer?" OK, that settles it. Obviously, you can have both worlds if you have a big wallet. I don't, but I don't mind that much because I don't want my grass hut in paradise to have all the comforts just like back home. Call me a masochist, call me a purist, call me anything you want...but I'll say it again: too much comfort kills the adventure of it all. - 1 self-tailing winch for the halyard sheets - maybe I'll get one in a few years when I can no longer do 100 push-ups every morning. - maybe also a new solar shower bag, the plastic head on my current bag is cracked, squirts water to one side, which is really beginning to annoy me. I also need to paint the mast, but that's maintenance and doesn't really count. So, as you can see, I have everything I need...almost.